Cutlets are boneless cuts of meat or poultry that have been sliced very thin or that have been pounded very thin. Cutlets are sometimes referred to as paillards. Cutlets / paillards are pounded thin to produce a piece of meat that cooks very quickly. They are made from boneless slices of chicken, turkey, veal, beef, and pork. The thin slices are generally cut from larger pieces of meat but supermarkets now have a variety of thinly sliced meats that can be used for cutlets / paillards, eliminating the need to cut the thin slice before pounding. Each type of meat has different cuts that are used for making cutlets / paillards. Chicken and turkey cutlets are made from the breast meat, veal cutlets are generally slices of meat from the leg or shoulder, beef cutlets can be slices from the tenderloin, round or sirloin, and pork cutlets are generally slices of meat from the loin or the leg. The cut of meat being sliced will determine how it is sliced. 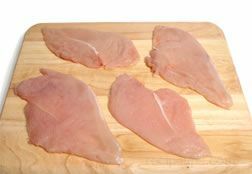 Chicken breast and thinner cuts, such as steaks, will be sliced horizontally. If it is a larger cut such as a roast, tenderloin or turkey breast, the cut should be sliced vertically across the grain. When slicing larger cuts, keep in mind that it is easier to cut a single muscle piece than a cut with the muscles running in different directions, such as a roast. The different muscles in the cut cause the direction of the grain to change, which makes slicing more difficult.. To make slicing easier, be sure the cut of meat has been refrigerated for at least 30 minutes before slicing. 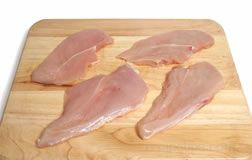 With the chicken breast or other thin cut of meat on a cutting board, place your hand flat on the piece of meat to hold in place. 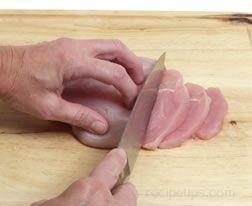 With a large, sharp knife begin cutting the piece of meat in half, slicing parallel to the surface of the cutting board. Be careful to stay clear of the hand placed on top of the meat. Cut almost all the way through the meat up until you are 1/4 inch from the opposite side. Open the piece up like a book to create one piece of meat. This is called butterflying. If the piece of meat you are working with is fairly large, you may want to cut all the way through to the opposite side to produce two smaller pieces rather than a butterflied piece. Place the cut of meat on the cutting board and cut crosswise to produce approximately 1/2 inch slices. Slices should be no more than 3/4 inch thick and no less than 1/4 inch. Note: If the slices that have been cut are uneven or not exactly the same thickness, they will even out when they are pounded. 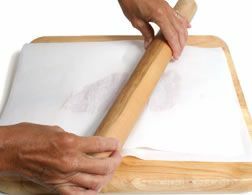 Place a sheet of parchment paper, wax paper or plastic wrap on a cutting board or another sturdy work surface. 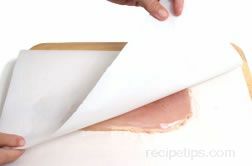 Place the slice of meat on the paper or plastic and then cover it with the same material. Using a meat mallet or rolling pin, begin gently pounding the meat. Pound over the entire surface of the meat until it is 1/4 inch or less and even throughout in thickness. If a meat mallet or rolling pin is not available, another heavy object can be used, such as the back of a heavy skillet or a heavy bottle. Once all of the slices have been pounded, they are ready for cooking. These thin slices are perfect for sautéing, grilling and broiling. Note: Pounding will break down the connective tissues of the meat, producing a tenderer cut. When pounding, be aware that some cuts of meat are more delicate than other so the strength used in pounding needs to be adjusted accordingly. 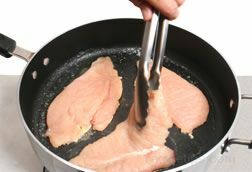 Be careful that the meat does not get torn or become too thin when pounding. It should not be less than 1/8 inch in thickness. Because the cut is thin and even in thickness, it will cook up very quickly, so it is important to not overcook the meat or it will become tough and dry. 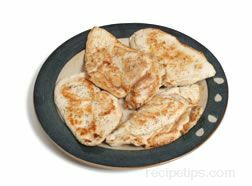 Cutlets / paillards can be sautéed, broiled or grilled in just a few minutes. Prepare cutlets / paillards as shown above. Add a teaspoon of vegetable oil and a teaspoon of butter to a heavy skillet. 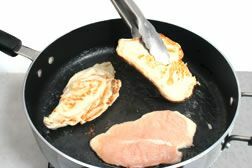 Preheat skillet over medium high heat just until the fat begins to smoke and then add the cutlets. Do not overcrowd. Cook for 1 to 2 minutes on first side and turn. The cutlets should be golden brown on the first side. Cook on second side for approximately 2 minutes. Do not overcook. Remove from heat as soon as it is golden brown. Season with salt and pepper and serve while hot. 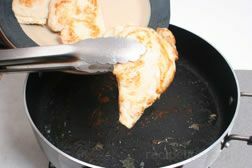 The pan can also be deglazed to create a sauce to pour over the cutlets when served. Preheat broiler. Have oven racks set so that the broiler pan is approximately 4 inches from the heat source. Prepare cutlets, pat dry and brush with a light coat of vegetable oil or olive oil. Place the cutlets on the broiler pan and place under the broiler. Cook the cutlets for approximately 3 minutes per side. Do not overcook. Season and serve while hot. Preheat grill with a hot fire. Place the cutlets on the grill over direct heat. Cook the cutlets for approximately 2 minutes per side. Do not overcook.